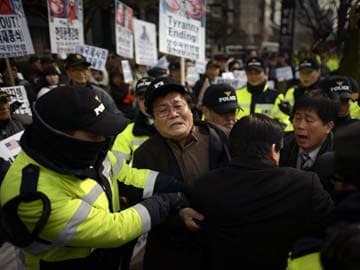 A conservative anti-North Korean activist is surrounded by police after attempting to set fire to a placard during a protest against the North Korean regime, in Seoul on Febraury 16, 2014. Seoul: Defectors and activists welcomed Tuesday a UN-mandated inquiry's searing indictment of gross human rights abuses in North Korea, but analysts questioned the international community's ability to act on its recommendations. Pyongyang's grim rights record has already been well documented by specialist monitors. But the size, breadth and detail of the report compiled by the Commission of Inquiry (COI) on North Korea - and the UN imprimatur it carries - set it apart. Kim Young-Soon, one of the many defectors who provided harrowing testimony to the COI, said she was grateful to the commission for recording the "nightmares we went through" for posterity. "North Korea has not and will never admit the existence of prison camps and this report won't change anything overnight," Mrs Kim told AFP. "But that does not mean sitting back and doing nothing. We need to keep collecting testimony so that someday it can be used as undisputed evidence to punish those behind the atrocities," she added. Now 77, Mrs Kim was a well-connected member of the North Korean elite in 1970, when she was suddenly dragged off to a labour camp as part of a purge of people who knew about the then-future leader Kim Jong-Il's affair with a married actress. So began a nine-year ordeal in what Mrs Kim described to the COI as "the most hellish place in the world" where inmates worked from dawn to dusk, supplementing starvation rations with anything they could catch, including snakes, salamanders and rats. "My heart still aches and I still wake up at night sweating just thinking about the prison camp I was in and family members I lost," she said Tuesday. A key conclusion was that many of the violations "constitute crimes against humanity". Although the COI's findings were nothing new to those working on North Korean rights issues, Hong said their publication was a "very meaningful step" with a UN mandate that would help pressure Pyongyang and its few backers. North Korea refused to cooperate with the commission, claiming its evidence was "fabricated" by "hostile" forces. The COI panel said that North Korea's leaders should be brought before an international court for a litany of crimes against humanity - a recommendation that many observers suggested was wishful thinking. Any substantive action on the part of the world community would require the participation of the North's key ally China, which has made clear it opposes any move to refer the Pyongyang leadership to the International Criminal Court. The issue of rights abuses "cannot be resolved unilaterally, nor swiftly, without transforming the political climate of the whole region", said Mr Petrov, a researcher at Australia National University. This would require, he argued, formally ending the Korean War - which concluded in 1953 with a ceasefire rather than a peace treaty - as well as diplomatic recognition of North Korea and the lifting of sanctions imposed for its nuclear programme. Otherwise the North would remain in a "perpetual and assiduously cultivated state of emergency" in which human rights were sacrificed on the altar of regime survival. "Without the goodwill of regional policy makers to address the problem of the Korean War especially, the issue of human rights in Korea is unlikely to be resolved," Mr Petrov added. Bill Richardson, a former US ambassador to the UN and a regular visitor to North Korea, said China would "probably" veto any attempt by the UN Security Council to give the "devastating" COI report any binding legal weight. "It's an isolated, unpredictable country," Mr Richardson told the BBC, but the shockwaves from the report "could be a source of pressure for moderates in Pyongyang who realise that there have to be some changes".